Studio 1 has since been upgraded with the installation of an 80-channel SSL XL 9000K analog console plus a Genelec 5.1 monitoring system. 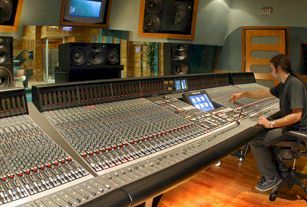 In terms of a new console for Studio #1, Ian Davidson, Olympic's Director of Operations, says that he thought long and hard about the frame size needed to handle today's high-pressure sessions. "These days, 56 channels are just not enough," he considers. "Having looked at one or two other consoles, the more we thought about it, the more obvious it became that an SL-9000 was the one to go for. Although Olympic has always been an SSL studio - it felt good to be able to continue that tradition - more importantly, the SL-9000 with Total Recall has now had a chance to prove itself. It sounds fantastic." "Why another SSL?" Davidson ponders. "Simply because it's really difficult to put a Neve into an SSL complex. We like the compatibility we now enjoy between our three main tracking and remix rooms; engineers are very familiar with the SSL user interface and automation functions. Moving between any of the rooms is a breeze!" "For instance, Eric Clapton records all his [English sessions] in Studio #1; Charlie Watts recently finished his latest album; Eternal recently recorded the music for a new Disney animated feature." Other artists using Olympic recently have included Shirley Bassey, Steve Hillage, Michael Ball recording "Phantom of the Opera," Mike Scott (ex-The Water Boys) recording a new solo album with producer Nico Bolas, Chris Kimsey mixing tracks, and The Lightning Seeds - "it's been a very diverse mixture," Paine recalls. "We think the SL-9000 is just the console to do justice to a very special room." Most recently, Eric Clapton was in Studio #1 overdubbing and remixing a series of new album tracks recorded in Los Angeles, with producer Simon Climie and engineer Alan Douglas. 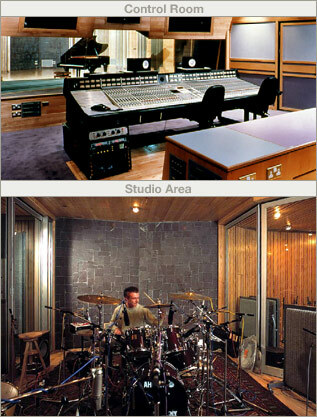 Studio #2's control room (pictured right) measures 7.6 by 7.2 meters (30 x 24 feet), and the recording area 11 by 9.7 meters (36 x 32 feet), with two iso booths. A Bosendorfer Grand with MIDI interface is also available. Studio #3, which handles remix and overdub sessions, features an 8-by-5.3 meter control room (26 x 17 feet) connecting to a small 5.5-by-3.8 meter (18 x 12 feet) live room. During the recent series of renovations and facility upgrades, Olympic Studios also made improvements to its creature comforts , including landscaping an attractive garden area, adding a large conservatory, as well as a full-size tennis court that doubles as a five-a-side soccer pitch. The conservatory features a large oak table that has an interesting pedigree. It is an identical copy of table that used to grace the dining room at Shipton Manor. It seems that former owner Richard Branson, who lived for a while in the magnificent building which connected to the original Manor Studios - in reality, a converted outbuilding with a new control room added in the late Seventies - wanted to retain the table after sale of The Virgin Studios Group to Thorn/EMI. As a compromise, Branson agreed to have an identical copy made of his favorite table, which now forms the focal point of a large, bright and airy conservatory in the rear of the complex. "Studio rates are competitive with London rates," Paine says. "Studios #2 and #3 go for between �1,000 and �1,100 per day [approximately $1,600-1,760], while Studio #1 rents for �1,250 to �1,300 [$2,000]." All rates include an analog multitrack and an assistant engineer. The smaller Programming Room, which features Amek/TAC Magnum and Mackie 32/8 consoles, a Otari MTR-90 24-track, a Sony DTC-1000 DAT machine, a Digidesign four-track Pro Tools system and an impressive array of MIDI keyboards, expanders, sound modules and Mac-based sequencers, is available for pounds 300 per day without operator (about $480).